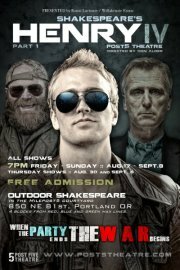 Post 5 Theatre’s production of Shakespeare’s Henry IV, Part I is playing in an outdoor courtyard at 850 NE 81st in Portland. The show is free and will play at 7 pm Fridays-Sundays, through September 8th. Historical plays and films are never easy to digest, because one feels they are being lectured to. In a moment, a person feels the Prof might say, now remember these dates and places, for they will be on the test. I was never a fan of history in school because I was always wondering, who are these people, how did they live, why did they do what they did, etc. But those little items were rarely in the lectures. Well, wake up, as Master Shakespeare has brought history to life, peppering us with those self-same items. So I will not preach to you on stone, cold facts but try to give you a sense of lives lived. Motivations for War and Politics are relatively simple and haven’t changed much over the years. Land…Greed…Jealousy…Prejudice…Power…Alliances made…Treaties broken…Lies…Deceit…Murder and, of course, God is always on their side. See any relevance to the Old West, European Wars, our modern times? To put it simply, King Henry the IV (Jeff Gorham) of England is trying to hold onto his lands. But other factions within England, chiefly Hotspur (the brilliant, Orion Bradshaw), and outside, such as the Welsh, Scots, Irish and even the French, have other ideas as to where borders should be drawn. Played out, in equal time to this melee, are the inhabitants of the Boar’s Head Pub, the heart of the story. Here resides Sir John Falstaff (Rusty Tennant) and his motley crew of misfits and mischief-makers. Into this mix is also Prince (Harry) Hal (Ty Boice), the King’s son, who is dutifully sowing his wild oats. He begins to sense, in time, he will have to put aside such “childish things” and become a King, Henry V. His innocence gone, his Youth shattered, the time to be a Man is just around the corner. Again, Universal story? Royalty will play, as they do today. Look at recent headlines for relevance of both factions. The inter-playing of these two stories is presented beautifully in this production, directed by Don Alder, a well-known Portland artist. The fight, principally between Hotspur and Hal, is exceptionally choreographed by Kristen Mun. The staging is simple and very serviceable to the stories. The blood and make-up, also effective. And the music/songs, well chosen. The battle sounds are good but too loud at times and covered some of the dialogue. Mr. Tennant’s Falstaff is equal parts gross, likeable, obnoxious, mad and witty. Rusty is terrific in the role and I couldn’t imagine anyone else doing it better. Mr. Boice is an amazing actor to watch. He is completely believable in his approach to the character of Hal. You see the conflicted side of him, as he tries to reconcile his royal duties with the “the good life.” It would be enlightening to watch him continue the story in Henry V. And, to prove the old adage, that there are no small parts…, Phillip J. Berns was absolutely charming in the role of Francis, a servant at the pub. He delighted the audience every time he appeared onstage. This is a production well worth seeing and a company well worth supporting. Although, free admission is always a good draw in these impoverished times, I’m sure they would heartily appreciate any monies you can donate to keep their dream alive. They are worth the best of us! Check out their website as to upcoming events: www.post5theatre.com Best get there early, as the small audience area fills up quickly. Bringing your own food and drink (yes, alcohol, too) is permitted. And bring a chair, too. Tell them Dennis at Uncovered sent you.